Daily meditation: check. Clean eating: check. Workout routine…well, we got two out of three. It’s that time of year when we make resolutions and try our best to stick to them. But hitting the gym a few days a week can be hard—and boring. That’s why we rounded up high-energy classes at five new fitness studios that are effective and fun. From dance party workouts to guided art hikes, plus two places to pick up new gear, here are seven ways to stay motivated. At the newest location of this Bay Area–born studio, you’ll choose from three different types of workouts—cycling, interval-based strength training and dance, all synced to party-ready playlists in classrooms lit for the mood. You’ll be wiped out in the best way possible by the end of each heart-pumping session. Practice your uppercut on a water-filled punching bag at the new FiDi location of this NY-based fitness studio. No boxing experience? No problem: The workout combines high-intensity interval training, strength training, metabolic conditioning and cardio to a pumped-up playlist of hip-hop and house and is more about doing a fun, full-body workout than perfecting your boxing skills. Did we mention the dim nightclub vibes and street-art projections of Steve Jobs, Mrs. Doubtfire and the cast of Full House? Barry’s Bootcamp, the L.A.-based workout from celebrity trainer Barry Jay, is taking the Bay Area by storm. 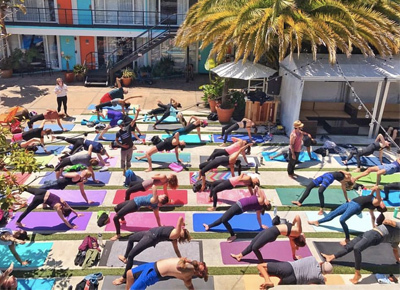 This month, the cult favorite is opening three new studios—one in the Castro, one at Stanford Shopping Center in Palo Alto, and on Howard Avenue—so that all the Silicon Valley ladies (and men) can get in on the high-energy, science-based class. The Castro location will be the largest yet, with a Fuel Bar for snacks and smoothies, plus dedicated parking, so you don’t have to worry about getting a ticket while you sweat it out on the treadmill. The idea behind the Megaformer exercises in Lagree’s 40-minute class is to go slow and hold positions to really feel the burn. It’s like Core40 in slow motion and it fuses low-impact but high-intensity moves in a full-body workout. The moves are so effective that you’ll feel a booty lift after just one session. If workout classes aren’t your thing, trick yourself into exercising by getting outside at the same time. The Presidio is offering free monthly events this year that will boost your heart rate while giving you a dose of culture. A guided Art Hike (February 9) will take you on a three-mile tour of world-renowned artist Andy Goldsworthy’s four forest sculptures. Or get schooled in wetland habitats on a Nature Walk (February 16) around Mountain Lake, where you’ll spot western pond turtles and Pacific chorus frogs. If you’re looking for that perfect outfit to get you excited to hit the studio, the search is over. SoMa’s beautiful and beloved MNT Studio recently opened the Shop, offering a curated collection of the team’s favorite activewear and lounge gear, plus accessories, clean beauty and snacks. Find yourself a Beyond Yoga crop top, cleansing oils from locally based Monastery and deliciously revitalizing Après protein shakes. On February 20, the Reset Collection comes to Batch, San Francisco’s expertly curated showroom of locally based home and lifestyle brands. The collection will encourage shoppers to stay on track with their wellness and fitness goals with everything from Hydrow’s at-home rowing machine to Modern Picnic’s chic vegan-leather lunch bags.